I don’t know about you but my magazine purchases are heeeeavily influenced by the freebies that come with them. Yes yes, I know they’re a marketing ploy designed for me to fall for them but hey, I fall and I fall gladly. I normally gravitate towards Look, Grazia, Company, Glamour, Marie Claire or Cosmopolitan but on the regular occasion that I should ONLY buy one (due to various bank balance, handbag size, you-haven’t-even-finished-reading-the-last-one restrictions), it’s normally the freebie that swings it for me. And this month’s Glamour magazine had a limited edition Kate Spade for Nails Inc sample and that little portion of my brain which loves a freeebie went into overdrive. Kate Spade! Nails Inc! Free!! The shade I got was New York Noir, a lovely glossy midnight black. I picked it because it’s not a colour I’ve got in my vast collection! But how does it look on my nails? Black can be unforgiving..
To be honest, I wasn’t sure at first – it’s essentially black varnish. The last time I wore black varnish I was at a ska-rock gig in a place called The Pitz! However, very surprisingly, New York Noir doesn’t look too emo-goth when applied. It’s glossy enough to actually look more chic and less Slipknot.. I think black nails add a toughen up a girly dress and they look make you look polished even when wearing a big cosy knit. And if you’re not keen on solid black, it makes a great base for polka dots, glitter and partcularly any of those special effects top coats. I’m going to brush a confetti top coat like this Barry M Confetti top coat which I bought. Just make sure you take extra care when painting as any smudges will show up BIG TIME. 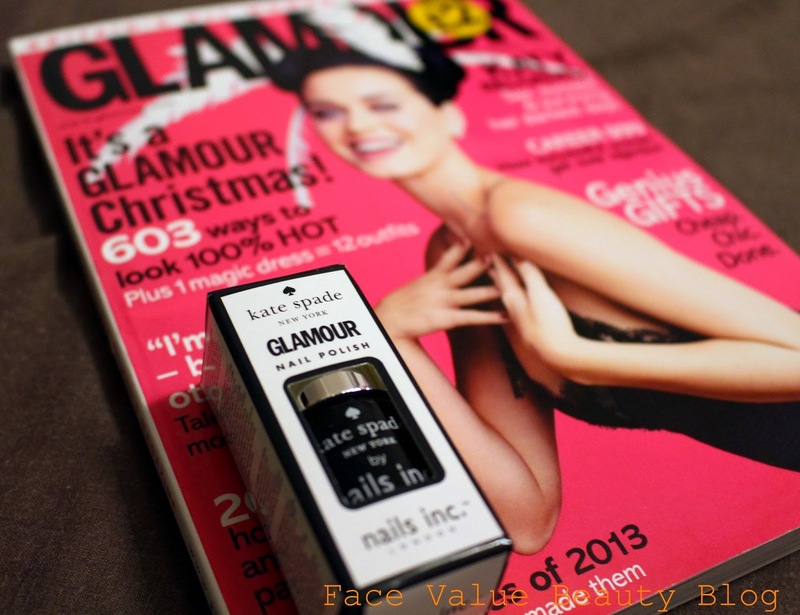 Did you grab any of the Kate Spade nail polishes with Glamour? What a bargain, only £2! What do you think of this shade? Is there any occasion for black polish other than Halloween? And what magazines do you go for? Are you swayed by the freebie at all? Previous Post Lush Christmas Bath Bomb Blowout – Which is your fave?